In recent months we’ve seen a slew of announcements about design software companies partnering with other design software companies to create easy integration of differing tools. It’s a mix and match of design software coming together in order to make life easier for the design engineer who has to manage multiple tools (PLM and CAD) or multiple versions of the same tool (CAD programs by different vendors). PLM companies are making it easier to integrate with multiple CAD programs, just as CAE and visualization tools are becoming easier to assess from PDM platforms. Recently BigLever Software, a provider of product line engineering (PLE), has partnered with No Magic, a model-based engineering (MBE) firm, to deliver an integrated PLE/MBE solution. 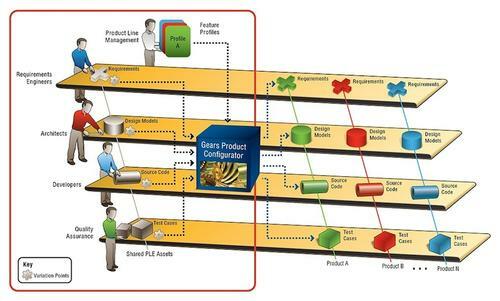 This diagram illustrates product line management. The new integration of design software tools combines PLE’s feature based variation management capabilities with the visualization, analysis, verification, and validation capabilities of MBE. The integration was designed to help companies develop product lines with greater efficiency as well as increased product quality and scalability while reducing complexity. By partnering with No Magic, and bringing the company’s MagicDraw tool into the PLE Ecosystem, BigLever wants to create a new dimension for MBE that combines PLE’s feature-based variation management tools with MBE capabilities. PLE is used frequently in auto manufacturing, as auto makers have to manage a wide range of features. “When you buy a new car, there are a lot of different features. The features constitute the different aspects of the product. Take a feature like a lane-keep. The implications of the presence of the feature requires software, lights, actuators, and electronic steering,” said Krueger. “For every product in the portfolio, PLE determines what features are in and what features are out.